Virginia Air and Space Museum -- "Your Boarding Pass to Adventure"
Why visit Hampton's Virginia Air and Space Museum? It all comes down to buttons. As my kids say, a cool museum "has to have lots of buttons." What kid thinks otherwise? That's why this museum fits my kids' definition of a great museum to a "T." Hands-on stuff, buttons, simulators, and IMAX, you name it, all of it (sneakily) designed to teach your kids gobs and gobs about science without letting them suspect they are being educated because they are having too much fun! My kids have loved this museum so much, that they've even gone to their fabulous summer camps (see below). The Virginia Air and Space Museum celebrates 100 years of aviation history, taking you all the way from viewing a replica of the 1903 Wright flyer, to riding in a WWII bomber, to becoming an air traffic controller, to pretending you're an astronaut. Our kids' #1 highlight is the huge AirTran Airways DC-9 fuselage that you can enter and explore. Most of the seats have been removed (it's surprisingly roomy without all those seats and passengers crammed in like sardines) to allow room for a Boeing 717 Simulator. Would-be pilots of all ages can try their hand at taking off and crashing...er, landing. Toddlers and preschoolers-- never fear, there's a Little Wings play area just for you. 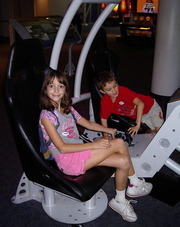 The Virginia Air & Space Museum has phenomenal traveling exhibits. For example, past exhibit "Great Balls of Fire: Comets, Asteroids, & Meteors" was an interactive look at the wonders of the sky. You'd learn to identify asteroids and comets, "save" the Earth from an impact by deflecting an asteroid, how to to identify meteors, and more. The Virginia Air & Space Museum and its 3D IMAX, is open every day except Thanksgiving Day and Christmas Day. Admission used to be complicated, depending on whether you were just seeing the exhibits, adding a regular IMAX movie, or adding a full-length IMAX Feature. But now, general admission includes a 45-minute IMAX (full-length movies are extra). 45-minute IMAX movie only: adults $8, children $6, seniors/military $6; (full-length IMAX movies that are 90 minutes or more are $1-$2 extra). IMAX Deals: Sometimes the museum offers Dining Deals. Dine at a participating Hampton area restaurant and you'll get $5 off a full-length IMAX movie at the Virginia Air & Space Museum. They tend to offer these deals during late spring and summer, so go to www.vasc.org for details. The Virginia Air and Space Museum is located on the historic Downtown Hampton Waterfront at 600 Settlers Landing Road - 757-727-0900. Last year, my son attended their "Space Camp," a week-long day camp where he practice making paper rockets, met an astronaut, learned about planets and the universe, viewed some of the exhibits, and just had an all-around good time. I totally recommend any of their camps! But beware: They fill up fast! They also offer spring break and holiday camps too. For details, go to www.vasc.org and click on the "Science Camps" link.